Welcome to Daytona Beach !! Our oceanfront condo overlooks the famous Sunglow Pier. Just steps to fishing on the Pier or just enjoying a meal at the Pier restaurant watching the birds. The unit has a master suite with a king bed, full bath with tub/shower. 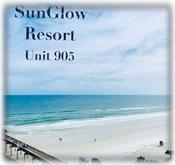 Sunglow Resort is a condotel.... hotel atmosphere with spacious condo accommodations. Large beachfront deck with pool, hot tub, and outdoor grills. COIN LAUNDRY AVAILABLE ON SITE. This vacation rental has been viewed 1,128 times since 11/20/2018. Each property is independently owned and operated. All listing information has been furnished by the property owner/manager. Please read our disclaimer.